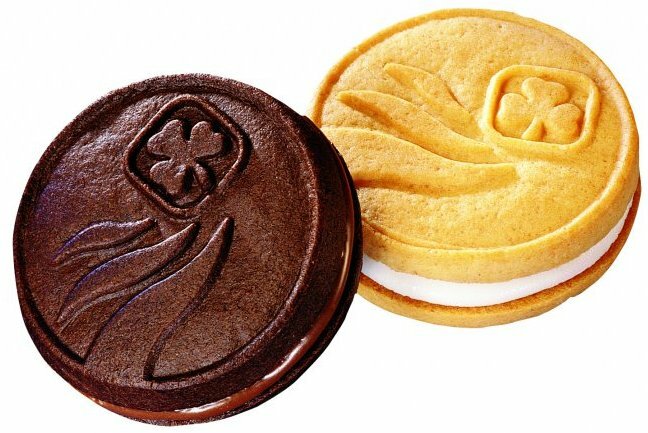 On Wednesday April 11th from 3:30 to 5:15 the 1st West Vancouver Brownies will be selling Girl Guide Cookies at Caulfeild Village Shopping Centre. For people like me who like the traditional chocolate and vanilla flavours you are in luck! In 1927, a Girl Guide leader in Regina baked and boxed up cookies for her girls as a simple way to raise money for uniforms and camping equipment. Little did she know that she was starting one of Canada’s greatest traditions - Girl Guide cookies! There’s a lot of history behind Girl Guide cookies! 1927 - The first GGC cookies are sold in Regina, Saskatchewan. 1929 - GGC starts selling cookies. 1946 - Vanilla crème, maple cream and shortbread cookies are introduced. 1953 - Classic chocolate and vanilla cookies made their first appearance. 1960 - A special box commemorates the 50th Jubilee of GGC. 1966 - The classic vanilla and chocolate cookies are back! 1967 - GGC centennial cookies are sold. 1991 - During the Gulf War, every Canadian soldier was given a box of GGC cookies upon arrival in Saudi Arabia. 1992 -Canadian astronaut Roberta Bondar, a former Member, carries GGC cookies into space. 2003 - All classic chocolate and vanilla and chocolatey mint cookies are produced in a nut-free and peanut-free bakery. 2008 - GGC introduced a bright new look for the chocolatey mint and classic cookie boxes to highlight the camaraderie, teamwork and variety of activities that Guiding offers. 2010 - The 100th anniversary cookie box is introduced for the classic campaign. The classic chocolate and vanilla cookies are now 0 g trans fat per serving.